Today we have some exciting news from past contributor Deborah Bogen. Deborah’s manuscript, In Case of Sudden Free Fall, has won the 2017 Jacar Press Full-length Competition. The book will be out next year. Six poems from the manuscript were chosen by Jericho Brown for the 2017 New Letters Poetry Prize and one of those, “The Year God Developed Cataracts,” was featured on Poetry Daily on May 15, 2017. You can read that poem here. Read four poems by Deborah in issue 12 of Superstition Review here. 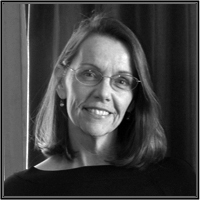 Deborah Bogen’s poetry books are Let Me Open You a Swan (Antivenom Prize, Elixir Press, 2010) and Landscape with Silos (National Poetry Series Finalist and winner of the X.J. Kennedy Poetry Prize, 2005.) Her YA Novel, The Wych of Lepyr Cove, was made available on Kindle and other E-book sites in Dec. 2013.